Completely renovated, surrounded by a Large terrace (70m2) with sea view.In the heart of Ostia, in pedestrian island. possibility to be present to free great events directly by terrace. Overall a very nice stay - as with everyone else we really enjoyed the terrace. Michela is very friendly and helpful. The central, seafront location of the property is great for shops, restaurants and the beach. The (expected) trade off is that it's noisy, at night with tourists and in the early morning with municipal workers - too much for the shutters to keep out. The fans help with the night time heat but air con would be an added benefit and probably essential in July & August. A great place to stay to be central for all Lido di Ostia has to offer! "Everything was perfect! I will gladly recommend this apartment for my friends." "Our stay was just PERFECT. Michela was lovely and informative and the apartment fit all of our needs and more. It was situated in a fantastic area, with lively activities every night. Great ocean view and quiet enough at night to get good rest. Tons of stores all around and the free beach was close enough for all of us to make the trek several times! Our children LOVED the big wrap around porch with the outdoor shower. We were two women with our five children and we felt completely safe in the apartment, and in the town. It was the best vacation I've EVER taken and I look forward to the next time that we can stay in Ostia and in this great apartment. Thanks Michela, I am telling everyone I know about your awesome place!!" Overall a very pleasant stay. I would gladly comeback next year." L’appartement de 1er abord est très propre et Michela est très gentille et serviable. Cependant l’appartement n’est pas du tout conforme à la description du site. Il est indiqué que l’appartement est climatisé: il s’agit de 2 ventilateurs et une petite clim mobile pour le salon dont le tube est cassé........il faut donc laisser la fenêtre ouverte pour que l’air chaud s’evacue!!! Sous 31 degré la nuit cela ne sert donc à rien! De plus elle est très bruyante et l’evacuation de la condensation de l’eau se fait via une petite bouteille qu’il faut vider toutes les 25 minutes! La situation de l’appartement fait qu’il est très bruyant. Le matelas pour le canapé dans le salon est un sur-matelas ce qui le rend assez inconfortable. Sur les fotos et dans le contrat sont indiqués barbecue et chaises longues, arrivés sur place ils sont inexistants ! Bref au lieu de rester 13 jours nous sommes restés que 8 car il était impossible de dormir! Même les enfants ne voulaient pas dormir dans le salon!!! Je suis très déçu d’autant que je passe chaque année par ce site pour mes réservations estivales ! J’y regarderais a deux fois avant de réserver via ce site maintenant!!! 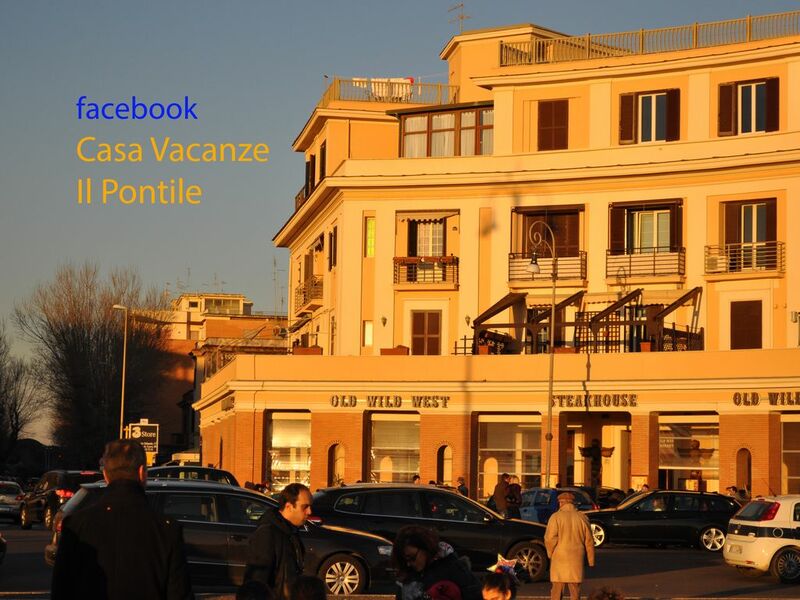 We came back to Denmark last saturday after we have spend a wonderfull week in Ostia in Casa Vacante il Pontile. When we were not in Rome we enjoyed the apartement and specially we enjoyed the lovely terrace and the beautiful view to the sea. We became A very kind velcome from Michela and it was very nice and reassuring to know that we had her phone number if we got any questions or problems. Thank you Michela. Il giorno di arrivo e partenza deve essere necessariamente il sabato, orari diversi da quelli descritti nel contratto vanno concordati alla prenotazione. Non previsti soggiorni di una o due notti. Si sconsiglia fortemente l'uso di taxi da/per aereoporto perché molto costosi. Meglio prenotare un transfer su www.tourshuttle.com, si dimezzano i costi. Consegna chiavi direttamente dal proprietario.